If you are aiming at success with your WordPress website/business, then you need to manage and monitor your projects adequately. You will have to plan out the entire project, organize it, layout easy to understand procedures and policies and make sure that all the deadlines are met. All these can be easily achieved via the use of powerful Project Management Plugins for WordPress. A WordPress Project Management plugin will help you and your team to stay on the same page and work together to meet every task and goal. Some of these plugins can also help project managers to make Quality Control checks, to make sure all their products and content adhere to specific standards. And best of all, these plugins provide all these project management benefits right from the comfort of your WordPress dashboard. We have put together a list of some of the best WordPress Project Management plugins in the market. The free plugins cover all the essential features and functionalities that will help you manage your projects. However, if you are looking for some advanced functionalities, then you will find your match in the paid section. Starting off our section of free WordPress Project Management plugins we have UpStream Project Manager. With the plugin, you will be able to manage any project that you are running on your WordPress site through the well-designed project management interface in your WordPress dashboard. One of the notable features of the plugin would be how efficient it tracks and monitors progress on a given project. You will get a dedicated ‘milestone and task’ functionality, which can be interlinked with one another, as well as automatic progress tracking. On top of that, the plugin offers the option to upload files and documents, maintain a discussion thread for better collaboration, as well as the ability to delegate work by using built-in roles for managers and users. Next up we have Kanban boards for WordPress. If you are accustomed to the task management app Trello, then Kanban will be very easy to take up and learn. The user interface is very much similar to what you get with Trello. It is also compatible with many popular WordPress contact form plugins like Gravity Forms, Ninja Forms, and so on. Coming to the features side of things, this WordPress project managment plugin allows you to create teams, assign tasks to specific team members, the option to ‘edit in place’ just like in Trello, and much more. Other notable feature includes a user permission management system, custom views for bookmarking, an editorial calendar, and a dedicated system for tracking sales. Now coming to Eonet Project Manager for WordPress. This project management plugin or WordPress, although free to use, is jam-packed with features. But it is worth noting that most of these features focus exclusively on the task management side of project management rather than anything else. For example, the plugin is excellent at creating to-do lists. You will also be able to create unlimited projects, display projects in an organized project-listing page, set different permission levels for each project, and much more. Now it is worth noting that the plugin has freemium planning, which means that some of the features require you to upgrade to the paid version. However, the features offered for free are good enough, and if you wish to pay for advanced functionalities, then our section of paid plugins offers many great options. TaskBreaker is a group Project Management WordPress tool which comes natively integrated with BuddyPress. This is the project management plugin to get for your WordPress website if you are already using BuddyPress. It entirely relies on BuddyPress and having the ‘Group Component’ enabled. But once BuddyPress is up and running, you will be smoothly managing projects with your ‘buddies’. Some of the features that you will love with the plugin include the graphical progress bar which shows how much each project has been completed. There is the option to assign multiple users or even an entire BuddyPress Group to a task/project. On top of this, there is also the option of smart task sorting based on priority and deadlines. Going on a budget, the Business Manager is a great ERP and Project Management tool for WordPress. This project managment plugin for WordPress allows you to manage your employees, projects, clients, and documents with ease. With the HR management functionalities of the plugin, you get to create a detailed database for your employees. The same can be achieved for your clients using the client management functionalities of the plugin. However, we are mostly interested as to how good is its Project Management functionalities. Well, for starters you will get a Kanban board to layout all your project, set a start and finished date for the projects, visually see how much of the project has been completed in percentage, assign employees and clients to see the projects, and so on. Now coming to the end of our list of free Project Management plugins for WordPress, we have Software Issue Manager. It is a special Project Management plugin which is designed explicitly for project-based bug and issue tracking. So it is a plugin worth keeping if you want more focus on quality control of your products. This project management WordPress plugin essentially comes with two elements. These are the “issues” and the ‘projects.’ Issues are all the items, namely bugs, you wish to track in a project. A project, on the other hand, is identified with a name and version number. You can assign multiple numbers of issues to each project, or share a single issue amongst various projects. The goal is to create a strong requirement management and analysis process to reduce bugs and issues. To kick off our list of premium/paid WordPress Project Management plugins we have WP Project Manager. It follows a freemium model which allows you to test out the plugin for free before you decide to buy it. However, we would recommend its Pro version over the free version just because of the sheer amount of advanced features bundled into the former. With the plugin installed, it will be like having your Basecamp in your WP site. You will have access to a dedicated dashboard to overlook your projects, create to-do lists, assign milestones to projects, assign user roles and permissions, and much more. There are also options for private messaging, file management, time tracking, a dedicated calendar view, and much more. Projectopia WP Project Management formerly went by the name CQPIM. 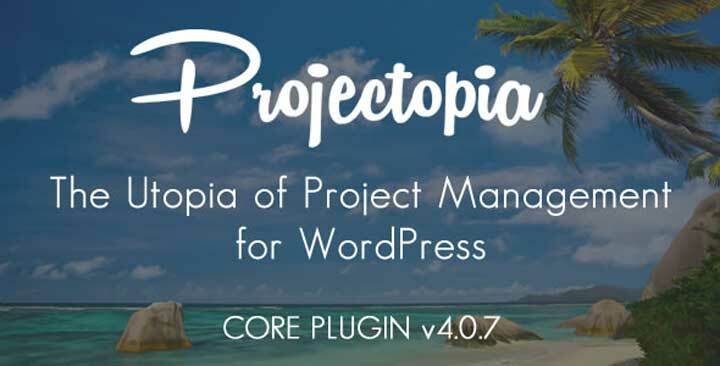 It is a very popular and influential Project Management plugin for WordPress and comes with a lot of features, as well as extra add-ons which you can install to make it even more feature-rich. To give you a feature overview, the plugin offers a comprehensive Project Management interface from where you can create and assign projects whichever way you like. There is also the option to create milestones, re-order them, create personal project notes, and much more. Other features include a client management system as well as a client dashboard, a team management system, the option to create quotes and estimates for clients, ability to generate invoices and also the opportunity to build support tickets. 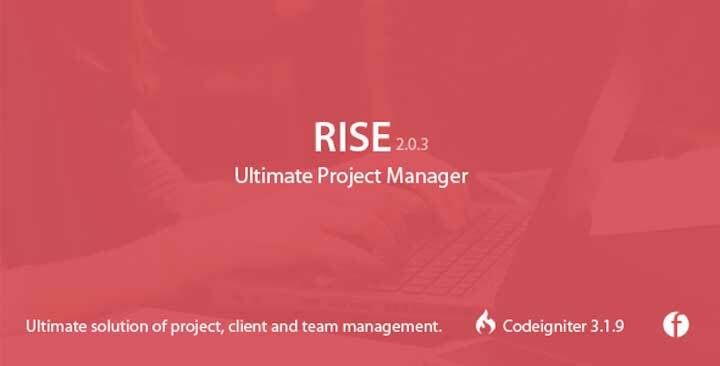 Rise WordPress Plugin, advertised as the “ultimate project manager” comes packed with features and tools to aid you with managing your projects, clients, and members. It allows you to monitor work progress, and collaborate with your team, right from the comfort of your dashboard. Coming to the feature side of things, the plugin comes with an event calendar, a web notification system to inform you upon specific actions(customizable), quick navigation around your projects, integrated online payment options, project activity logs, expense tracker, custom fields that suit your clients or team members, and so on. 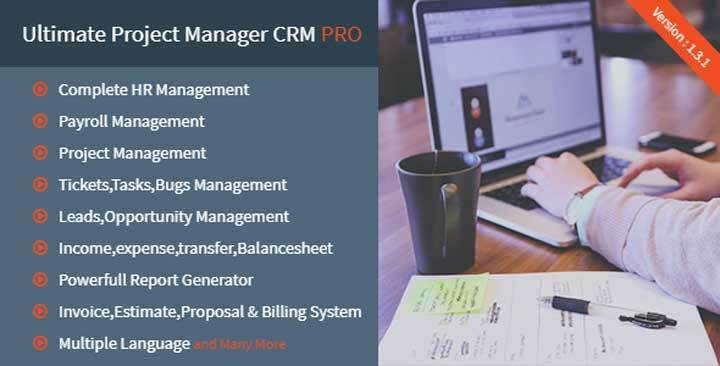 The Ultimate Project Manager CRM pro is an appropriately named management plugin for WordPress as it helps you not only with Project Management but also with customer relations management and human resource management. It has a boatload of features that will help you before the project starts, during the time the project is in progress, and even after it has been completed. With this CRM plugin, you will able to create, assign, and keep track of your projects seamlessly. The HR system helps you with managing the payrolls for your team, assign leave holidays, and also boasts three different types of attendance system. And if that is not all, you get features like leads and opportunity management to help you get more clients, as well as a built-in invoice generator, as well as a project estimation, proposal, and billing system. There is also a powerful reports generator, and a ticketing system to help you take in and resolve your customer’s queries. 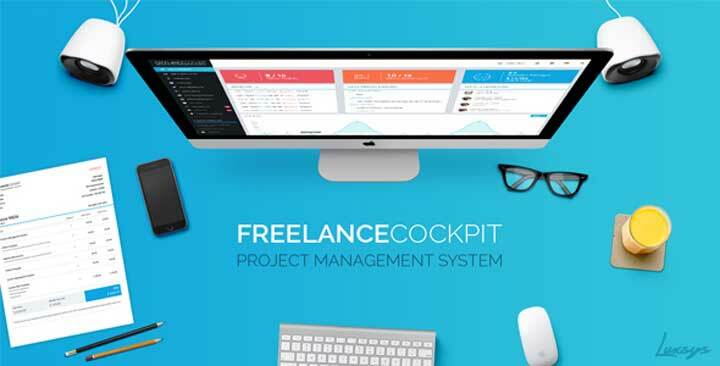 Freelance Cockpit 3 is targeted at freelancers to help them manage all the different projects they have from their various clients. This project management plugin is loaded with a lot of features, but it is most notable for its ease of use and the comprehensive overview it gives you over your work. You will be able to access all your important projects right from the sidebar. There is also the option to track all your project related tasks from directly inside your projects. Then you get statistics on your business progress, opportunity to create and send invoices to your clients while on the go, and even communicate and collaborate with your clients using the built-in messaging functionality. Any Other WordPress Project Management Plugin? So these were our picks for the best WordPress Project Management plugins in the market. We hope you found this list to be helpful and that these plugins help you better manage your projects and tasks. Also, if you have a story on how these plugins helped you to manage your business better, then feel free to comment and let us know. Your fellow readers will love to get some real-life examples of the utilities to such plugins.